I unfortunately wasn’t able to check out the recent show Pavement Paradise: American Parking Space at the Center for Land Use Interpretation in Los Angeles, but I’ve just ordered the compact companion volume and have been flipping through it. 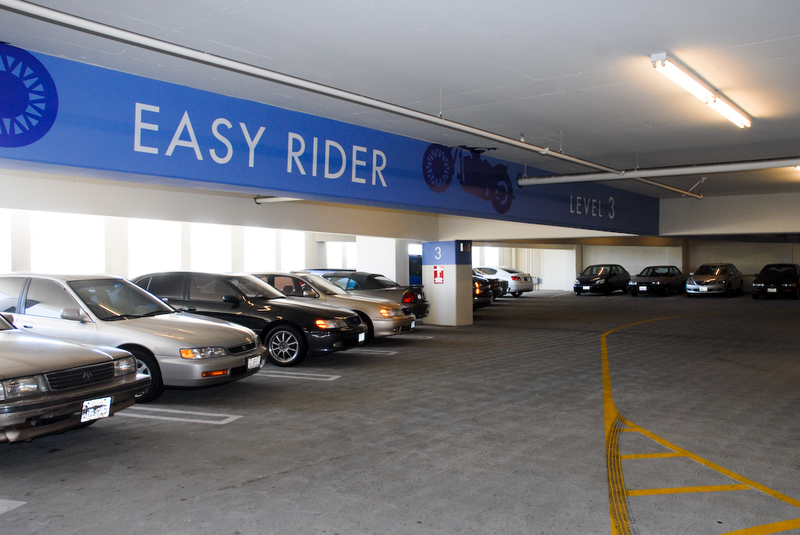 * Parking lot designed is influenced by the average turning radius of vehicles (an inside diameter of 15 feet). * Lot movement is generally counterclockwise so that right-hand turns can be made without crossing lanes. * By the year 1961, 38% of downtown L.A. was parking lots. * 24 inches between vehicles is the recommended minimum (the average space is 7 feet, nine inches’ wide). * Spiral ramps are more dangerous than other configurations. * The “dump time,” or the amount of time it takes to empty a major lot (like after a concert) should not exceed one hour, or drivers will get nervous. * Retail parking is typically three times the size of the retail itself. Also, parking-heads should not miss the excellent short film by Ryan Griffis of the Temporary Travel Office. This entry was posted on Wednesday, June 25th, 2008 at 1:59 pm	and is filed under Parking, Traffic Wonkery. You can follow any responses to this entry through the RSS 2.0 feed. Both comments and pings are currently closed.